Lately, I’ve been thinking about how much the local food scene in Austin has changed over the years. Many years ago, I visited the lone, quiet, little farmers’ market on Wednesdays in the parking lot of the old Whole Foods. That was way before Whole Foods moved into the current flagship location with the corporate headquarters upstairs. It was just a handful of us who showed up for the market which consisted of a few vendors who brought a couple of carrots and maybe a turnip or two. I’m exaggerating, of course, but there wasn’t nearly the array of produce, eggs, meat, seafood, prepared foods, and artisan-made products you can find at our markets today. And, these days, we have farmers’ markets in several parts of town happening almost every day of the week. It wasn’t even that long ago, three years perhaps, when getting locally-grown asparagus was difficult. I remember the first vendor who offered asparagus and how precious and limited the supply was. When I heard it was available, I rushed to the market early one Saturday morning and nabbed one of the few, skinny bunches. This year, I’ve seen multiple vendors with beautiful asparagus. More artichokes are showing up lately as well, and I’m thrilled to hear we’ll be receiving some from our CSA next week. It’s exciting to watch our local food options continue to expand. Last month, I brought home lots of asparagus from Hairston Creek Farm. It was so fresh and tender and completely unlike what’s available at the grocery store. I sauteed chopped pieces of it in butter and poured whisked eggs over the top to scramble with it. I also tossed some chopped asparagus into a Thai curry soup just to warm it through before serving. And, I made my favorite asparagus dish of all time. 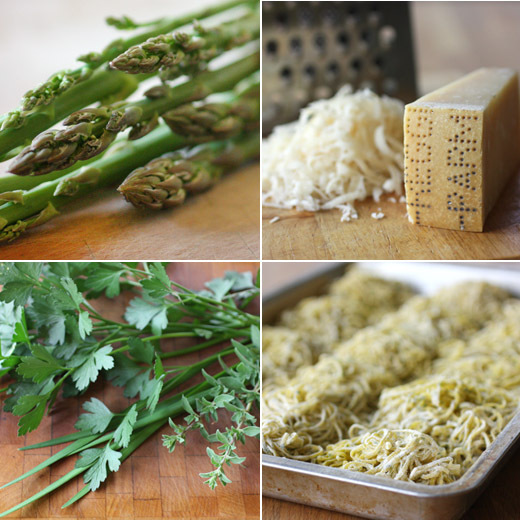 I’ve been making this asparagus pesto for years during the season, and I never thought to mention it here. It’s incredibly simple, and the texture of the pesto is silky smooth. I usually use dried pasta, but this time I went all out and made fresh pasta with chopped herbs incorporated into the dough. It was a celebration of spring on a plate. The pesto is found in On Top of Spaghetti which is one of my most favorite books for pasta. You simply roast one pound of trimmed asparagus spears at high heat, like 500 degree F, for a few minutes until tender. Roasting time will depend on the size of the spears. Just toss the spears with a little olive oil and season with salt and pepper before roasting. Once the roasted asparagus has cooled a bit, roughly chop it and use a spatula to transfer the asparagus pieces and any oil from the pan to a blender. Add two-thirds cup of extra virgin olive oil, and I know that sounds like a lot, and puree until completely smooth. Taste and add more salt if needed. That’s the asparagus pesto. It can be made in advance and stored in the refrigerator. Just bring it to room temperature or heat it in a saucepan over low heat before adding to cooked pasta. For the pasta, I followed another favorite recipe which is found in Stir: Mixing It Up in the Italian Tradition . Two cups of flour are mixed with two whole eggs plus four egg yolks and a teaspoon of salt. I mix the dough in a bowl, and then knead by hand for a few minutes before wrapping the dough in plastic and letting it rest for 30 minutes. This time, I also added chopped herbs from my garden which flecked the dough with green. Speaking of color, my pasta dough was especially yellow this time thanks to gorgeous eggs from Milagro Farm. The yolks were beautifully orange. I divide the pasta dough into four pieces for rolling through the machine, and I cut the rolled sheets into thin spaghetti for this dish. I left the pasta to dry at room temperature for half an hour, and then covered it to store in the refrigerator until I was ready to cook. A big pot of salted water was brought to a boil, the fresh pasta was cooked for two minutes or so, and some pasta water was saved before draining. Since I was enjoying our local asparagus so much this year, I bought extra and quickly cooked some chopped pieces to add to the pasta as it was tossed with pesto. I added a little pasta water to thin the pesto slightly. In On Top of Spaghetti, Pecorino is suggested for serving with this dish, but I always use Parmigiano Reggiano instead. I have a lot of favorites when it comes to food, but this is in that special category of favorites. 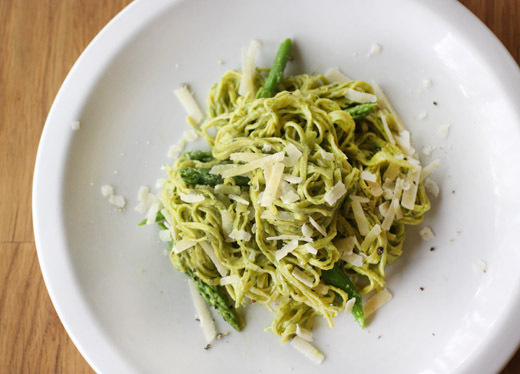 Getting to make this pesto with locally grown asparagus and the fresh pasta with incredible, local eggs and home-grown herbs made it better than ever. It’s a continuing pleasure to watch our local food scene grow and to discover new things each time I visit our markets. Refined and succulent! Spring in a plate. Just like Rosa said...Spring in a plate. Yum! I agree - so springy! And as always your photos are beautiful! What a lovely looking and nourishing dish. Lisa, we are back! I am so passionate about fresh locally grown produce, the taste is so much more clean and strong. The movement of locally sourced organic produce has been possible because the consumer wanted it. Now the movement of growing your own food is growing like a wildfire. I love asparagus and artichokes, they mean spring. I have been growing edibles for years and this year I have increased the space to grow even more things, really satisfying. I even planted artichokes, asparagus didn't do so well. Love it Lisa, can't wait for local asparagus!!! I found the most beautiful asparagus this week. Roasted with a splash of olive oil and sprinkles of salt and pepper it was divine! The pasta with asparagus pesto is radiant! A wonderful and vibrant ode to early spring! I just saw another recipe for asparagus pesto that I want to try soon. So perfect for spring! I've heard really good things about On Top of Spaghetti — I should definitely check it out (I think the authors have another book, too). I haven't seen local asparagus yet, but it should be coming soon! I can't wait. Lovely dish - thanks. Wow so there's no cheese or nuts in the asparagus pesto? It sounds so interesting (and I love the name of that book 'On top of spaghetti' :P). Lorraine: Right! It's a "pesto." The only cheese is scattered on the pasta after it's mixed with the pesto. That bowl of pasta looks delicious. Nice shots. Really a nice Spring dish. 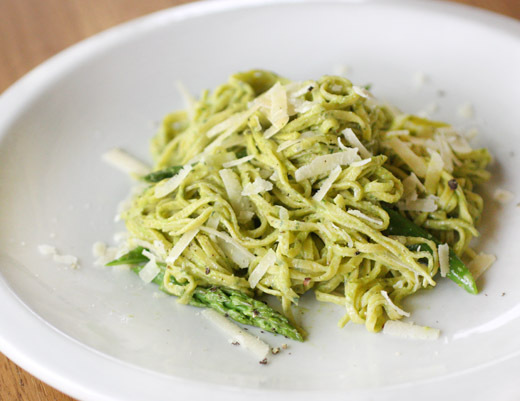 i'm not crazy about asparagus, but in pesto form, i don't think i'd mind it. classy dish, lisa! I love that you actually made the pasta yourself! I need to do that more often. What a gorgeous meal! Yummy. Homemade pasta is simply the best thing ever. I like the asparagus pesto, very clever.